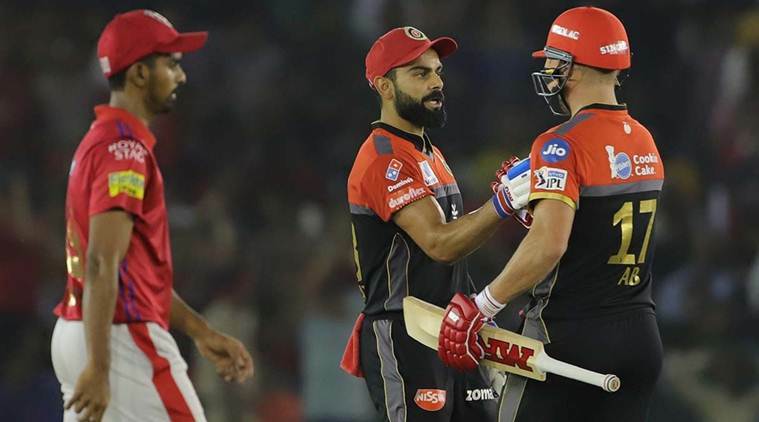 Royal Challengers Bangalore suffered six defeats at the start of Indian Premier League 2019 season and then picked up their first win against Kings XI Punjab on Saturday. Now, they get ready for Mumbai test. The response from cricketer-turned-commentator Akash Chopra summed up what Royal Challengers Bangalore’s first win in the ongoing season of Indian Premier League meant. “Finallÿ”. RCB suffered six straight defeats, becoming the franchise with joint-worst start to an IPL season, along with Delhi Daredevils (now Capitals), who also lost their first six games in the 2013 season. The Virat Kohli-led side will travel to Wankhede Stadium on Monday as they get ready to face Mumbai Indians test. Hoping to ride on the winning momentum, RCB would hope to spoil Mumbai’s party, who will be entering into the contest after a surprise defeat to the bottom-placed team Rajasthan Royals. One of the primary concerns for Mumbai, going into the contest, would be Alzarri Joseph’s fitness. The allrounder has been in prime form but was seen wincing in pain after suffering a shoulder injury in the field on Saturday. His absence might open up Mumbai’s bowling attack for big hits and make them appear vulnerable. Mumbi bowlers were hammered by Jos Buttler who scored 89 runs in 43 balls. The confidence would have taken a massive hit after such a hard beating and Alzarri’s absence could hurt them even more. Apart from Kohli and AB de Villiers, the only other RCB batsman who has been among runs is Parthiv Patel. The left-handed batsman is going through personal issues – his father is currently in ICU. But keeping it aside, Patel has contributed at the top and has looked good with both keeping and with the bat. But now the team is starting to find form, it is time for other batsmen to step up as well. Moeen Ali, Akshdeep Nath, Marcus Stoinis and Pawan Negi need to get among the runs and ensure that the team does not get too dependent on Kohli and ABD. RCB have roped in Dale Steyn for injured Nathan Coulter-Nile in their side which might improve their fast bowling department. Umesh Yadav, Navdeep Saini, and Mohammed Siraj have been expensive and have struggled in the death overs. Even Tim Southee has not looked his best in the tournament. RCB’s bowling line-up is too dependent on Moeen Ali and Yuzvendra Chahal. The inclusion of Steyn could provide them with a strong bowling unit.